Open Gallery is an art project developed in 2018 by Waterford Healing Arts Trust (WHAT) which invites people living with dementia – and their family members / carers – to look at, discuss and enjoy paintings from the University Hospital Waterford (UHW) Art Collection in a safe and welcoming space, supported by professional artists. Open Gallery has two strands: Strand 1 for patients at UHW and Strand 2 for people living with dementia in the community. For the purposes of this case study, we will focus on Strand 1. Open Gallery is inspired by Meet Me at MoMA, an internationally renowned and evaluated programme of dementia-friendly art viewing workshops, devised by the Museum of Modern Art, New York, and introduced to Ireland as the Azure Programme by the Butler Gallery in Kilkenny, in collaboration with Age and Opportunity, The Alzheimer Society of Ireland and IMMA (Irish Museum of Modern Art). Primarily, but not exclusively, patients living with dementia, along with their family member/carers and staff. Everyone is made welcome. When designing Open Gallery, links were formed with the Clinical Nurse Managers (CNMs) and the Occupational Therapists (OTs) on the medical wards to design a protocol to identify patients who would most benefit from participation. To combat loneliness and isolation for people living with dementia by offering patients and their family members/carers the opportunity to create new memories through a shared art viewing experience. To offer opportunities to change the conversation between patients, family members and staff away from people’s illness. To create an opportunity for patients to discover a new interest or re-ignite a previous interest in art. To actively engage patients and stimulate their imagination, memory and intellect. To create opportunities for staff to deepen their knowledge/understanding of each participating patient. To encourage patients, family members and staff to engage with the artworks in the hospital, so that the collection becomes an oasis of art in the midst of an otherwise stressful environment. The Open Gallery team consists of a lead artist and a support artist, and three staff from WHAT. 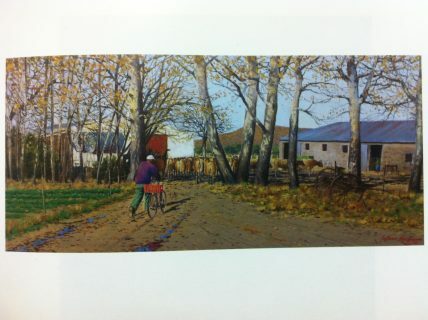 For each Open Gallery session, we select three artworks from the UHW collection, based on a theme, for example, colour, family, landscapes or Waterford-based artists. With assistance from ward staff, we display the artworks in a ward bay with participants sitting in chairs or beds around them. In one session, nurses moved a patient on an IV drip, in his bed, to the centre of the ward to improve his view. Communication is key, so we begin by introducing ourselves to every participant to check that they can see the artwork, hear us, to gauge their knowledge of art and to establish who might need extra support to contribute to the conversation. The support artist then works with these participants to ensure their voice is heard. Participants are invited to look at the artwork, describe, interpret and connect through a series of open questions and sharing of responses. Often the conversation leads to places we couldn’t have anticipated. 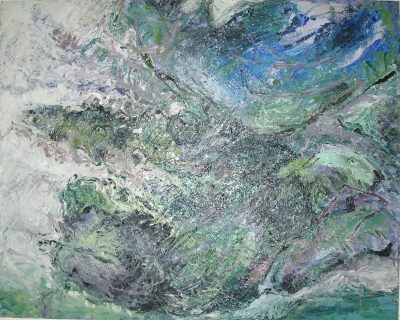 In one session, looking at Bernadette Kiely’s painting 'Sky' (see slideshow above), patients immediately became animated and jumped into a discussion around the colour, the brushwork, the view – 'a bird’s eye view!' Our notes went out the window and we learned how magical a piece of artwork can be. Each Open Gallery session ends with a cup of tea, which gives us time to chat further and for us to reflect, particularly with quieter participants. We document one-to-one feedback with each participant (patients and family members/ visitors), with their consent, at the conclusion of each session. We discuss with ward staff the impact of the session on each participant. We engage in reflective practice, documenting and analysing each session to assess its impact and effectiveness, and make improvements. Feedback from patients, family members and staff is universally positive. Setting: Initially, the sessions were conducted in the Family Room, to give patients and family members a break from the ward. 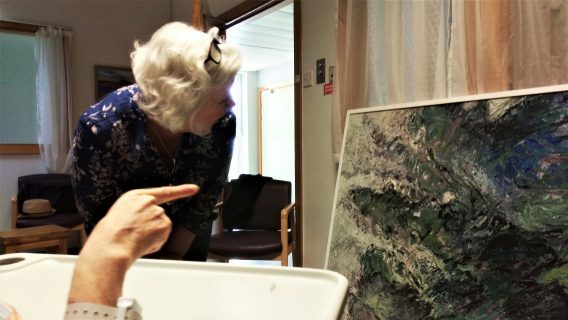 While this intimate setting allowed participants to focus on the artworks without distractions, a number of patients were inadvertently excluded from participating as they were unable to leave the ward for various reasons. With the support of ward staff, we moved location to one of the bays on the ward. This has led to greater numbers of patients and family members participating, as well as increased visibility and understanding of the project among patients, family members and staff. Participation: A challenge of conducting sessions on the ward is working around those who are too unwell to take part, or who choose not to participate. Our good working relationship with staff helps us to manage each of these cases on an individual basis. Resources: Open Gallery involves a significant investment of personnel to set up and run the project well: 2 x artists, 1 x project co-ordinator and documenter, 1 x assistant art curator, 1 x art handler, in addition to support from nursing staff on the ward. WHAT has made a strategic decision to invest this level of resources into this project because of the growth of dementia in Ireland and globally, in addition to which Open Gallery complements the work of UHW to operate as a dementia friendly hospital. We created a poster outlining the project aims, objectives and outcomes which was selected for the UHW Quality Improvement Conference 2018. This poster was also selected as one of 25 objects celebrating the work of Waterford Healing Arts Trust for the organisation’s 25th anniversary. In addition, we will give a presentation on Open Gallery at Arts and Health Check Up Check In 2019.